The puppets always draw attention by their interesting movements. Puppet Wrestling is a cool fighting game with fun gameplay, cool graphics and a unique twist on the wrestling genre. You can play the game against your friend and your goal is to touch head of your opponent to ground or to wall. 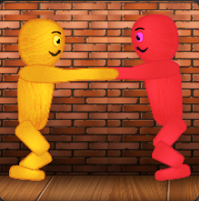 Watch how the puppets move and try to work out the best way to overcome the opposing player. The bars on the top of the screen show will tell you much damage each puppet has received. Use different kinds of bonuses that will add more fun to the game, like slow motion, upside down screen and more. Invite a friend over and have fun with Puppet Wrestling!